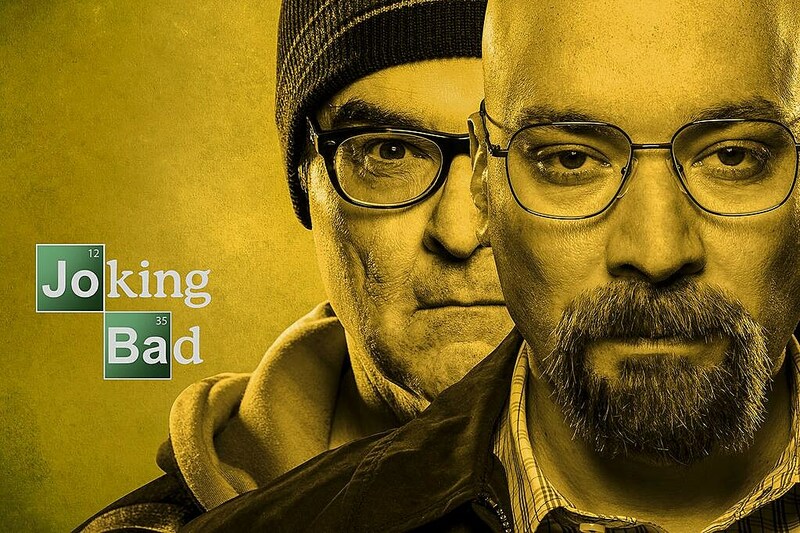 ‘Breaking Bad’ to Get Jimmy Fallon Treatment, Plus Badger’s Animated ‘Star Trek’ Pitch! It's no secret that 'Breaking Bad''s final premiere episode "Blood Money" knocked the socks off fans and critics alike, effectively doubling its viewership since last year's season 5 premiere "Live Free or Die." And while the AMC drama continues riding high in its final eight episodes, the web has responded in kind with a new Jimmy Fallon spoof in the works, and an animated adaptation of Badger (Brandon Mayhew)'s hilarious 'Star Trek' pitch! Elsewhere, Vulture managed to craft an impressive animated adaptation of Badger's 'Star Trek' pitch written into last night's premiere, wherein the stoner character described his vision for an original series episode in which Chekov cheats at a pie-eating contest by using Scotty to beam the pies out of his stomach, before things take a disgusting turn. In the meantime, you can check out both Fallon's photos and the animated parody below. Stay tuned for the latest 'Breaking Bad' final episodes news, and tell us what you thought of "Blood Money" in the comments!